Inside this fun, colourful book there are 12 aquatic friends from all over the world to choose from, each with a very distinct personality. The projects vary in level of complexity and there is a comprehensive and straightforward techniques section to help learn the necessary skills. The book covers a wide variety of themes from Christmas knits, baby bootees, phone covers, mug hugs, headbands and scarves, so there is something for everyone to enjoy. If you've always fancied taking up embroidery but didn't know where to start, this guide for the absolute beginner is for you. This simple-to-follow project-based book takes you through the basic techniques of this fun and creative craft. Go crochet crazy with this colourful collection of cushion covers. Featuring 26 modern, stylish designs, from bobble-textured rectangles, striped bolsters and ruffled circles, to hearts, owls, chickens and granny-square patchworks, this inspiring, easy-to-use book has something for everyone. 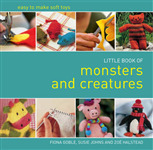 Featuring projects for parents and children to work on together - from leaf prints to finger puppets, a sock snake, a mosaic picture frame, rockets, and juggling balls - this book includes the chapters covering papercraft, recycling, painting and printing, needlecraft and naturecraft.